It turns out that according to Starbuck, she’s only been gone about 6 hours, even though to the rest of the fleet, she’s been gone for about 2 months. And her Viper looks as if it just rolled off the showroom floor. And there are gaps in her memory. So the evidence seems to point toward her being abducted or something, and placed in that Viper for the return trip. Although why would the Viper be brand new like that — as if it were plucked out of a previous point in time before it had a chance to get beat up? So my theory is she went back in time, and worked her way back up to the present again, picking up an old Viper (before it was old) along the way. And she just doesn’t remember it, because she’s a Human/Cylon hybrid, and did everything on autopilot. So now I’m thinking … what if Earth only exists in the past? 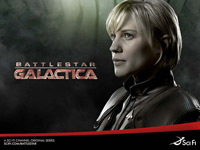 Which means what Starbuck has to do is lead the fleet to some phenomenon — like the mandala thing she passed through — that will carry the entire fleet (including some Cylons) back in time to Earth. And Earth becomes the great-grandfather of the Twelve Colonies, complete with Earth mythology and some kind of genetic memory of what happened that gets passed on to a select few like Roslin and Baltar. And there you have the latest version of my pet time loop theory. Feel free to poke holes in it! Meanwhile, I’m really enjoying the way the 4 new human Cylons — Tyrol, Tigh, Tory, and Anders — have already started to hold little pow-wows, the way the first 7 models do. There’s an irony in the fact that the humans have many gods, but believe in a chain of command in which one person makes decisions for many. But the Cylons, who believe in only one god, tend to make decisions in a very democratic fashion. I can’t help but think of these groups of Cylons as something like “The Founding Fathers” in American history. Anyway, so not long after Starbuck returns, the Cylons attack. But then Anders (call sign “Longshot”, which just HAS to be a shout-out to the X-Men character of the same name, who was an artificial human with a glowy eye and the power to skew probabilities in his favor) goes out in a Viper to help defend the fleet, can’t seem to make his gun work, comes face to face with a Cylon raider, eye contact is established, some infrared or Bluetooth signal gets exchanged … and the Cylons just go away. Now there’s a neat trick. As for the now-free Gaius Baltar, you may or may not be surprised to learn that he’s getting laid. Amazing but true. As a scientist, women threw themselves at him. As the despised president of New Caprica, women threw themselves at him. And now, as the Messiah for the crazy contingent, women are yet again throwing themselves at him. But they’re also throwing their sick children at him, filling his head will all these icky feelings of guilt and humility. He makes an appeal to the Cylon God to take his life instead of an encephalitic child, and after a life-threatening scrape in which the Six in his head asks him if he really means it, the child’s fever breaks. Another neat trick. Oh, and Roslin and Six are finally bonding. I predict they’ll be BFFs by the end of the series.